In order to make this as readable as possible, I am going to start with the stuffing ingredients (which have been halved) and process, and then discuss two delicious uses. Parboil the chard leaves for 4 minutes, drain and cool, then squeeze out the moisture with your hands and chop. On medium low heat, saute the guanciale (or bacon) until it is just browning (i.e. not yet crispy), then remove to the side. Leave the melted fat in the pan, turn the heat up slightly and brown your finely chopped or ground pork, and remove to the side. In the same pan and in the melted fat, saute your onions, chopped chard stems, garlic and butter on low heat for a few minutes. Stir in the rice, farro, guanciale, pork, tomatoes, chard leaves, thyme, oregano and a pinch of nutmeg and cook for a minute or two, then turn off the heat, letting the mixture cool and tasting for salt and pepper. This was the recipe shown in the picture at the top of the blog post, and it made for an great meal. A mmmfffffgh you can’t talk because your mouth is so happily stuffed kind of meal. The below amounts will feed 4 ravenous adults. *Note on the flour: I know many people are trying to switch to weight, but I did not have a scale handy, and frankly, since some of my favorite cookbook authors each have their own ratio of flour to butter, I don’t think scientific precision is necessary here for a great result. There are many ways to make pate brisee pastry. This currently is my favorite method but use whatever method you like best: chop the butter into 1/4 inch cubes and then place in the freezer for a few minutes. Combine the flour and salt in a food processor, and then add the butter. Pulse quickly twice. Add 2 tablespoons of water, then pulse, and repeat twice more. Dump the loose mixture onto your work surface and push it together with your hands. As needed, add small amounts of ice cold water and mix it in until the pastry dough is starting to stick together. You do not want to overwork it, or add so much water that the dough is sticky, and there can still be some crumbly elements that are not yet sticking to the mass. Push it all together into 4 separate balls, including as much of the crumbly elements remaining, wrap in plastic wrap and place in the fridge for at least 30 minutes. Place your stuffing in the food processor and pulse several times until everything is more finely chopped and mixed. Flour your work surface and roll out one of the balls to approx. 1/8″ thickness, leaving the others in the fridge until needed. You can make whatever size meat pies you want: little 3″ diameter circles like empanadas, or in my case, larger 5.5″ diameter circles that were made by inverting and pressing down with a rimless bowl. Use a paring knife to trace the circle outline and remove the circle of dough to a different surface. Withe 3″ circles, you might only want to use a heaping teaspoon of the stuffing. These larger rounds took 1.5 to 2 tablespoons of stuffing. Wisk up an egg wash (just beat an egg) and apply it around the stuffing with a brush. Fold over the circle creating a half-circle, and use a fork to flute the edges and create the seal. You can also apply the egg wash to the top and sides of the pie to get a beautiful golden color and gloss, although you can see with the top photo that I did not bother with that step this time around. Place the pies upright on a baking tray and cook in the oven for 30 to 50 minutes, until nicely golden. 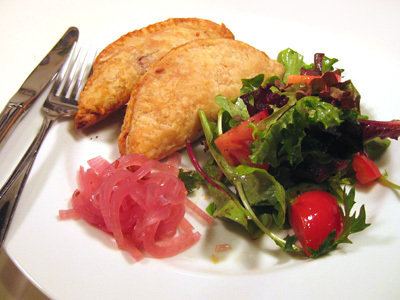 I served these pies with some pickled red onions, and the combination (taking them both in the same bite) was just fantastic. You can do a fast pickle, where you put the sliced onions in a hot mixture, or take a more patient approach. In this case, I applied Stephane’s pickling method for ramps, which you can find halfway down this post [link]. Whether you want to stuff the entire cabbage or just the leaves, the first step is the same: remove the outer green leaves of the cabbage, trim the stem, bring a large pot of water to boil and then simmer the cabbage for 10 to 15 minutes, drain in colander and let cool. To stuff the full cabbage, lay it atop a large square of cheesecloth and gently peel back the outer 20 or so leaves. Then remove the heart by slicing across the core, being careful not to cut through the stem holding your 20 leaves. You can then chop up some of the heart and add to the stuffing, if desired. 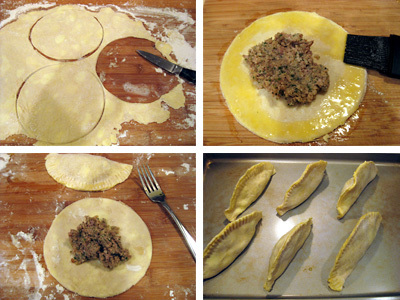 Shape the stuffing into a ball, placing it atop the center, and reform the cabbage leaf by leaf. Enclose the cabbage with the cheesecloth and tightly tie off the top using kitchen string. This can be kept in the fridge overnight, or you can move ahead to cooking, covered in chicken or vegetable broth (you might need as much as 3 to 5 quarts depending on pot and cabbage sizes), for 3 to 4 hours at a very light simmer. To serve, place it in a bowl and unfold the top of the cheesecloth. Place a plate on top of the bowl and flip. Remove the cheesecloth, and flip the cabbage back into the bowl. Now, serving an entire cabbage has a nice rustic, family feel to it, but we decided we preferred individually stuffing cabbage leaves (or if you prefer, large chard leaves with the stems removed). The advantage of stuffing leaves is that you can just get two cabbages and use as many leaves as you need, not having to worry about matching stuffing amount to cabbage size (although that problem did lead to delicious pork pastries!). Individual leaves also create nicely packaged portions. To stuff individual leaves, mold the stuffing into individual meatballs 1.5 or 2 inches thick, and roll each one up in a parboiled cabbage leaf. Place in an oven capable pot, like a large dutch oven, and pour enough heated broth to cover. Place in an oven set to 325F and cook for an hour or two. 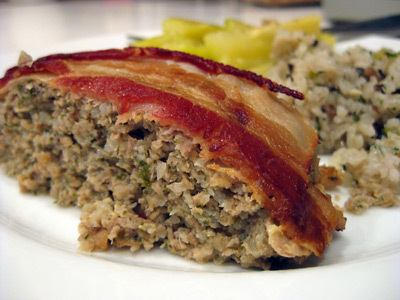 As I mentioned, I did also make a meatloaf with extra stuffing (which had gone through the food processor, similar to pork pastry recipe), by mixing in two eggs, molding into a loaf on a baking dish, covering with bacon, and cooking for an hour at 350F. It was a huge hit with my 4 year old, and I enjoyed it paired with a shallot, spring onion and mushroom pilaf. I still prefer my normal meatloaf recipe, but this made for a nice change. Zis is very good, I like everyzing. Wow. This is a production, but worth it. I have been looking for a recipe for pickled onions forever. I keep asking the pickle/jelly guy at Union Square Market, why he doesn’t have pickled onions? He has pickled carrots, pickled radishes……..? You always choose such nice comfort dishes to make. I am going to try your brisket recipe this weekend. You certainly found two great ways to use up that never-ending stuffing! The pork pastries and meatloaf look amazing and I think I agree with you that I’d prefer individual cabbage leaves stuffed as opposed to the whole head of cabbage. And it sounds like a flavorful stuffing in deed. I have some vine leaves in the fridge I need to use and I think I’ll try this as opposed to my usual “Greek” stuffing. Thanks! (puffing away on a Gauloise) – pass ze meatloaf will you mon chou? Nom de dieu!! You make a damn good written impression of the French accent Giff! Zat is vairy imprecive!! See.. i’m not as good as you and i’m French for chrissake! I will be taking lessons from you and claire. hehe. The pork pastries look fabulous. Put a few in the freezer for breakfast next week, would you? Just loving those pork pastries! I could certainly do with a couple of those right now. And the pickles – blimey, what a fantastic color to them. I love pickled veg (onions or shallots especially) with pork. as regards switching to weight – its about bloody time! Moving to the US, I have never got a handle on the inaccuracy of cups – especially in something so ratio-important as baking. it tastes like a spicey meatballa!!!!!! Too funny! I had leftover pastry dough from my neighbor and I had a ton of leftover cabbage roll mix and I googled exactly those ingredients! I found your recipe for cabbage mix pies and am sooooo excited to take them out of the oven! Thanks for the recipe!